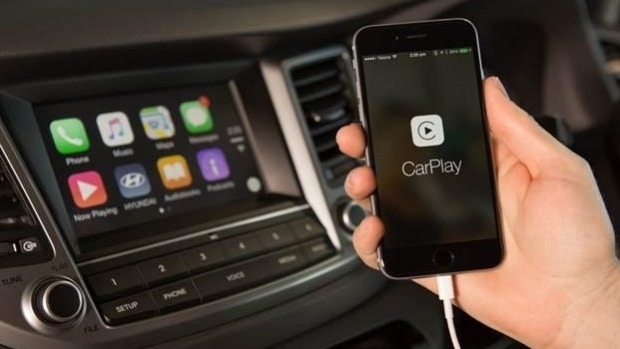 Hyundai New Zealand claims that it will be the first mainstream car brand to bring the Apple CarPlay phone-vehicle interface to the local market. The system will be fitted as standard to the Korean brand's new Tucson crossover; it's pending local approval and is likely to be given the go-ahead in the next few weeks. It's not active on the first batch of Tucson models that have been imported, but can be retro-installed once the system gets the green light. Also known as "iOS in the car" when it was announced last year, Apple CarPlay integrates a user's iPhone within the car's own operating system (OS). It's more advanced than the forms of Bluetooth tethering currently used by most carmakers, which simply give you access to certain phone functions via the car's display and controls. CarPlay makes the mobile device part of the car's own OS, presenting a user interface the same as the phone and giving access to a range of applications on the device. Users can engage with the iPhone's Siri voice control through the vehicle, for example, or see mapping from the phone displayed directly onto the car's screen. CarPlay currently requires a physical connection to operate, so the iPhone must be plugged into the car. The volume of data involved requires Apple's new-generation Lightning cable, so only iPhone generations 5 and 6 are compatible. Hyundai is the first, but there's a long list of car brands that have have signed up for CarPlay and some, such as Mercedes-Benz, are also committed to making the system work on older vehicles. Google's rival system, Android Auto, is also on the way. Many car brands have developed compatibility with both. Systems such as these are seen as the ideal solution to a major problem facing in-car connectivity: the pace of mobile development makes in-car information and entertainment systems obsolete too soon. Shifting the functionality to the device itself ensures that the in-car OS is always up to date.